Perricone MD Pre:Empt Series Brightening Eye Cream, 0.5 oz. 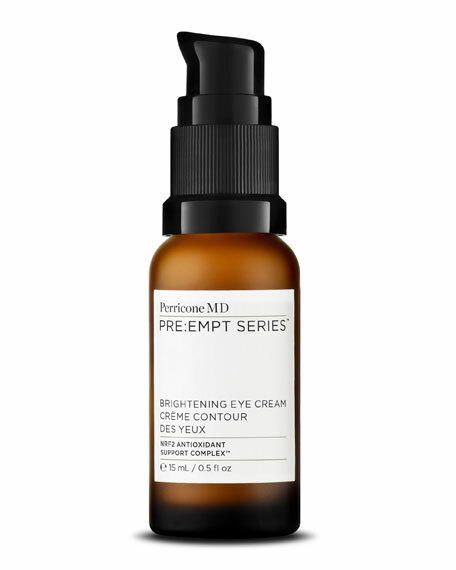 Perricone MDPre:Empt Series Brightening Eye Cream, 0.5 oz. Pre:Empt the first signs of aging and preserve youthful skin. Brighten the eye area to reduce the appearance of dark circles for a more awakened appearance. Provide deep hydration to prevent visible finelines from surfacing while reducing puffiness and signs of fatigue. Dr. Perricone's unprecedented, proprietary NRF2 ANTIOXIDANT SUPPORT COMPLEX helps preserve youthful beauty. Formulated to address the specific skincare needs for skin not yet in need of correction or repair. Conditions skin with essential moisture to Pre:Empt the first signs of aging. NRF2 ANTIOXIDANT SUPPORT COMPLEX powered by phytonutrientsTurmeric, Olive Leaf, Green Tea and Cress Sproutshelps activate antioxidant pathways to keep skin looking and feeling more youthful. GENTLE AVOCADO OIL conditions the delicate, vulnerable skin around the eyes. ENCAPSULATED CAFFEINE helps in the reduction of puffiness. PEPTIDES help combat the appearance of initial fine lines. DMAE visibly lifts, firms and tightens skin. Dr. Perricone recommends applying along the eye contour in gentle patting motions. Use morning and evening. To achieve optimal results, apply before Exfoliating Pore Refiner, Skin Perfecting Serum,Brightening Eye Cream or other Perricone MD moisturizers. Avoid contact with eyes. If contact occurs, flush immediately with water. For in-store inquiries, use sku #2268822.